Since the last update, we have not received an answer to the legal and procedural concerns raised in the letter to Deputy Director Chow. However, the Harbors Division has taken another step against FFOC by removing our ability to access the pier and ship independently. We had to remove our locks and Harbors Division has hired a contractor to ostensibly maintain the ship, as he does with other vessels in the harbor under Harbors control. We are told that Harbors Division has not planned out their next steps and we have confirmed they have not approached any regulatory agencies. We are consulting with the National Trust for Historic Preservation regarding the regulatory and legal issues we are following. We have not received regular updates on progress being made by Save Falls of Clyde International to contract with a heavy lift ship or yacht transport with a date certain. We believe we can hold off Harbors Division if a definite removal date is confirmed. We must keep the faith. We waited patiently for the result of the auction. Only three parties attended the February 15 “open house” and only one person was not affiliated with the local Falls of Clyde supporters. On February 28, no qualified bidders had come in. The requirement for a $1.5 million performance bond was impossible for any party to acquire, which made the whole auction moot. This has now pushed the Harbors Division into their other options, which are to negotiate a sale, transfer the ship to another government organization, or remove and destroy the ship. Friends of Falls of Clyde is looking into legal options to forestall the last option. We fully believe that the Harbors Division should negotiate with Save Falls of Clyde International to achieve the repatriation to Scotland. 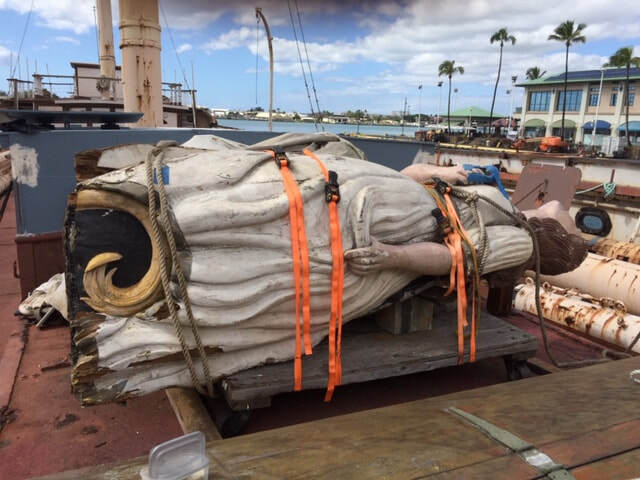 Friends of Falls of Clyde is committed to maintaining the safety of the ship until she can be removed from the harbor and repatriated to Scotland. The cancellation set the stage for a very stressful month and the deadline to move the ship set by Harbors Division as February 6, 2019. Falls of Clyde began to ride low in the stern and a small hole was discovered, which was quickly patched and ballast moved in the tanks to raise the stern. Within two weeks she began to list abnormally to port. Investigation discovered a hole on the port three tank. FFOC brought in a contractor to repair the hole and again ballast was readjusted to get the ship back in trim. Finally, as the month came to a close, the ship took on water in the bow through some rusted areas and Harbors and the Coast Guard declared an emergency and brought in contractors to pump out water and patch the leaking areas. FFOC brought in a contractor to remove ballast in order to bring the ship up higher to move the water line above the leaking areas. 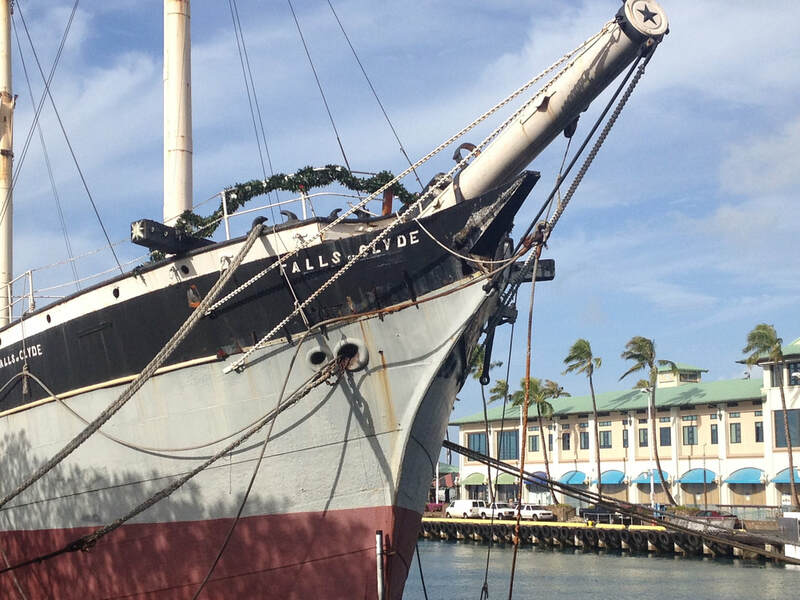 Tens of thousands of gallons of water were removed and the ship is now back in stable condition. However, Harbors Division now considers that a state of emergency is ongoing, which means they have an urgency to move the ship for what they consider the safety of the harbor. While this was going on, FFOC was working with Senator Hirono’s Chief of Staff to see if Falls of Clyde could be moved temporarily to Pearl Harbor until the Scotland move occurred. The problems cited above basically made this option no longer feasible. Friends of Falls of Clyde board members met with Harbors administrators on February 1 as a post assessment following the emergency. Also attending was the local representative of Save Falls of Clyde International, whose input on the status of the repatriation to Scotland is at a critical juncture. It was reported that a substantial grant is pending that Save Falls of Clyde International may receive. We were also told that Sevenstar Yacht Transport is still interested in moving the ship back to Scotland, but it will be a couple of months to get scheduled. The Harbors administrators laid out three terms that must be met in order to reconsider the auction: Save Falls of Clyde International must have a signed and paid for contract with a carrier, a firm date for the move must be set before hurricane season begins June 1, and a plan to safely maintain Falls of Clyde until the move must be provided. Friends of Falls of Clyde is committed to comply with the third requirement. While there is some optimism that all will come together, time is short. As the year draws to a close, we are looking forward to February and our celebration of Falls of Clyde leaving for her new home and restoration in Scotland. We had a positive meeting with Harbors Division, where Capt. Ed Enos, who is handling the logistics locally for Save Falls of Clyde International, was able to discuss what plans are being discussed with the Sevenstar operational personnel and the progress that has been made toward preparation for the move. We had a visit from a naval architect student from Strathclyde University in Scotland, who wanted to spend time on the ship because he is part of a team that is working on a design project for the restoration of the ship once she is back in Scotland. He was impressed by our wonderful lady of the sea. Friends of Falls of Clyde sends a Happy New Year wish for a prosperous and peaceful 2019!!! This period was one of action. First, we celebrated Falls of Clyde’s 140th birthday on12/12/18. A small group was allowed to come aboard for a small celebration. 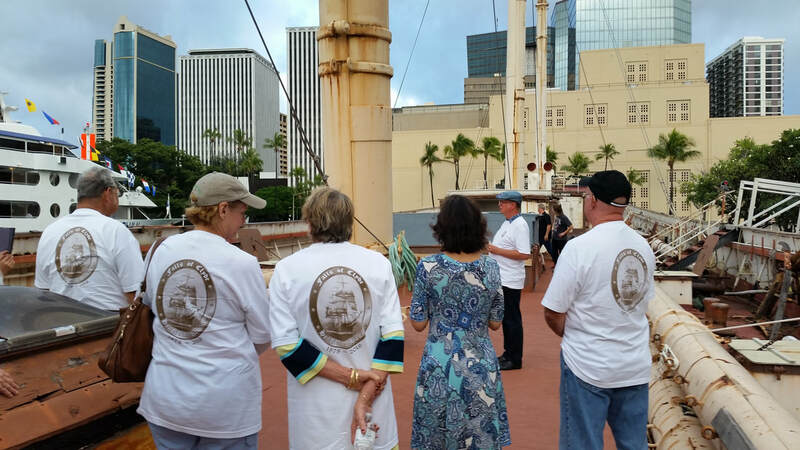 A birthday lei was put on the bow, a short history of the Friends of Falls of Clyde was reviewed and then the attendees had delicious birthday cupcakes followed by the annual whisky blessing given by president Bruce McEwan. Here are a couple of pictures. 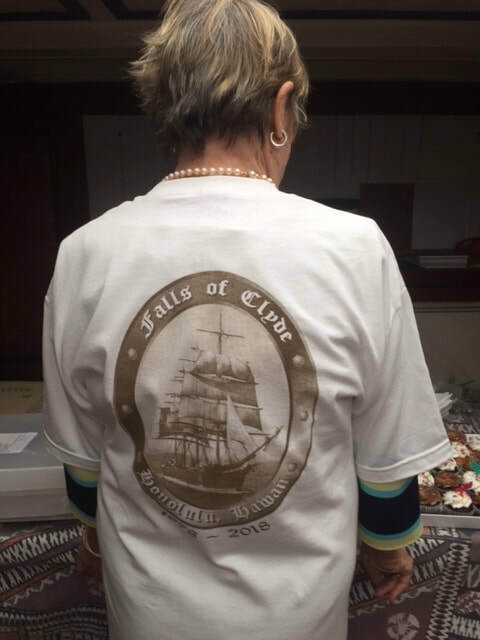 To commemorate her 140th birthday, Friends of Falls of Clyde had a special t-shirt designed. Here is a picture. The shirts are made to order and are available to anyone who wants to make a donation of $15 or more. Local mailing needs an additional $2 and a mainland order needs $5 for mailing. Orders can be made by sending name, address, size and a check to Friends of Falls of Clyde, P.O. Box 4674, Honolulu, HI 96812. 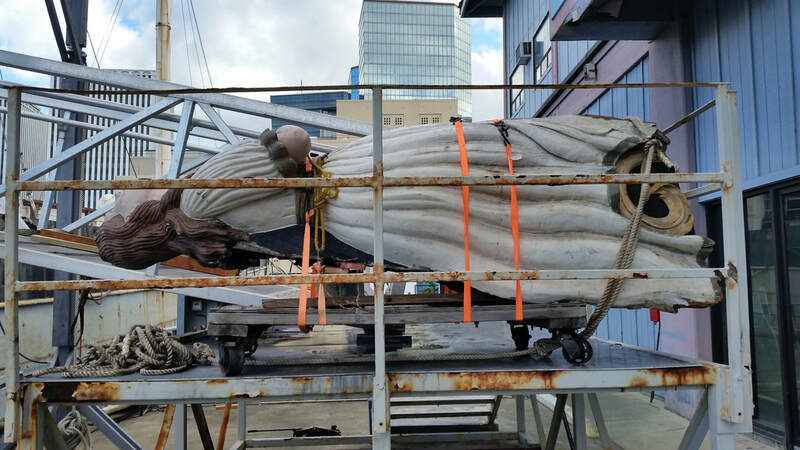 The second activity was moving the ship’s figurehead from storage into the deck ready for her voyage to Scotland. The work to get her on board took 3 days. Here are some pictures of her move. Excellent news came this month. David O’Neill finalized the agreement with Sevenstar Yacht Transport and a copy of the scope of the project was given to the Harbors Division. The target date for the repatriation of Falls of Clyde to start is February 3, 2019 with the expected arrival in Scotland on or about March 28, 2019. The local team handling logistics in Hawaii are now in direct contact with Sevenstar so planning for the move will move ahead quickly. There has been a lot of positive publicity in Scotland which has been picked up here. 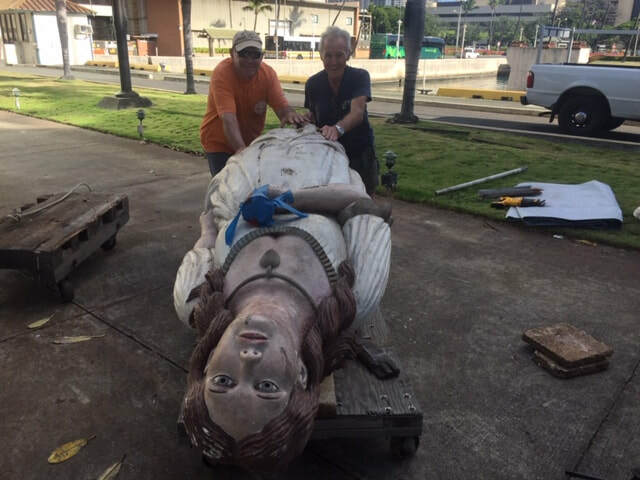 We have gotten an important story in the StarAdvertiser and the Historic Hawaii Foundation has communicated to its membership of preservation advocates that financial support is needed to help underwrite the move. At this time we are still waiting to hear about Matson’s willingness to provide support for this historic project.